Why are Afghan Sikhs desperate to flee to the UK? 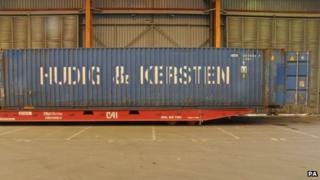 In August, 35 Afghan Sikhs were found in a container at Tilbury docks - one had died. But why are they so desperate to come to the UK? The prayer hall at the Afghan Sikh temple in west London is packed with worshippers listening to the harmoniums and drums. Most of the people inside have at one time fled from Afghanistan. It is a country thought of as Muslim but there is a tiny minority of Sikhs, and their numbers are ever dwindling as they try to escape persecution. Very little had been heard about Afghan Sikhs until 35 were found at Tilbury docks nearly three weeks ago. Those who were found alive in the shipping container are now claiming asylum so they can join relatives and friends already in Southall. The temple has been helping them with donations of food and clothing. Officials like vice president Harbans Singh Handa were shocked at what happened. "My heart really hurt when I heard the news and I just couldn't believe that they would risk their lives. They've already died a death in Afghanistan, their rights have been taken away, and yet they're willing to risk death to come here," he said. Many Afghan Sikhs in Southall took long, circuitous journeys to get to the UK, relying on smuggling gangs to help them get out of Afghanistan. In one of Southall's markets, Manmeet Singh explained how he used an agent to get him to Pakistan. "In Pakistan somebody told me there is a safe place, England, very nice people are there. So I took four aeroplanes to get to Heathrow. There were very kind people at the airport as well. They told me don't worry about everything," he said. That was 12 years ago and now Mr Singh has a successful business. But he left behind a thriving shop full of stock abandoned when he fled. It is estimated that the number of Sikhs in Afghanistan has shrunk from around 100,000 three decades ago to somewhere between 2,000 and 5,000 now. So what is fuelling the exodus? The turmoil of the civil war in Afghanistan in 1992 and the subsequent rise of the Taliban left many with their civil liberties infringed. But the Sikhs say it has been worse for them. Cremations, a fundamental part of their belief, are frowned on. The practice is forbidden under Islamic law and the main cremation ground in Kabul was moved miles out of the city. And there is pressure to convert to Islam. Mr Singh said: "There are hassles and beatings and sometimes they want money. At fasting time, when we are cooking, they come, spill the food and there are beatings as well. They ask 'why do you not fast? Why do you not become Muslims?'" The Taliban forced the Sikhs to wear yellow armbands and the Sikhs say they were pushed out of top jobs and their children were discriminated against in schools. Bhajan Singh Kapoor, who runs a charity to support Afghan Sikhs, said: "A whole generation of Afghan Hindus and Sikhs has remained illiterate in the past 30 years. Because of this war and turmoil they cannot be educated in the government-run institutions because of bullying. "Previous to the war in Afghanistan we had doctors, engineers, lawyers coming up from the main school system of education. But from the last 30 years there is nothing at all." Figures for how many Afghan Sikhs now live in the UK are not readily available, so the BBC commissioned the Office of National statistics to analyse the census. Data shows over 10 years, between 2001 and 2011, the number of Afghan Sikhs almost trebled to just under 7,000. But this does not show how many live in the UK illegally. The temple vice-president in Southall believes the true figure is much higher. So what is in store for those found at Tilbury now making asylum claims? The Home Office would not comment, but the BBC has discovered that the country guidance issued by the UK government has changed. This is the advice that immigration officials use to assess asylum claims. In 2012 it said Sikhs did not face widespread discrimination and even if they did, relocating to Kabul, where there was a larger community, might solve the problem. The most recent report says they do face widespread discrimination and it is pessimistic that the community in Kabul is large enough to give them security. The Tilbury refugees are now having regular interviews with border officials and it is unlikely they will get a quick answer. But what is likely is that other Afghan Sikhs will try to get to the UK by any means possible. Bhajan Singh Kapoor whose charity supports people seeking asylum, said: "I think there will be more and more people trying to get into safe countries. I think Britain will be the first choice if they can make it." Melanie Abbott presents The Report: Afghan Sikhs on BBC Radio 4, at 20:00 BST on 4 September - or catch up on BBC iPlayer.